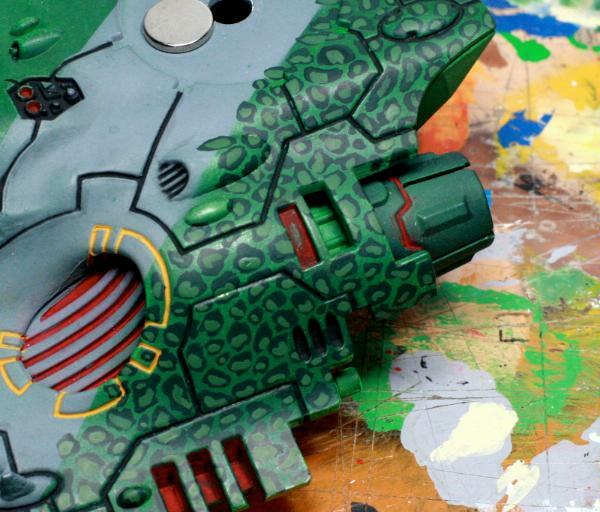 Lately I've been going back to my Eldar tanks and adding additional detail. They were originally painted with a straight stripe, but now I'd like to soften the stripes with a more organic look. I've painted one with a vine pattern and wanted to experiment with another technique. Since my army is led by Fuegan, Phoenix Lord of the Fire Dragons, I figured reptilian scales would fit right in with the theme. I call it scales, but it could be described as a leopard spot-type pattern as well. It works great as a camouflage pattern. Here's how I went about creating the scales effect. This technique really only requires two colors, but we will mix the two colors for an in-between shade. The colors selected in this case are a shade darker and a shade lighter than the base color already on the tank. Orkhide Shade is the darker base color and Goblin Green will be the lighter highlight. If you are starting with a dark base color, like black or dark blue, then you can pick two colors lighter than the base and build the scales up from a dark background instead of putting a dark scale on a lighter background. Select different colors for a dramatic scale effect or more similar colors for a subtle scale pattern. 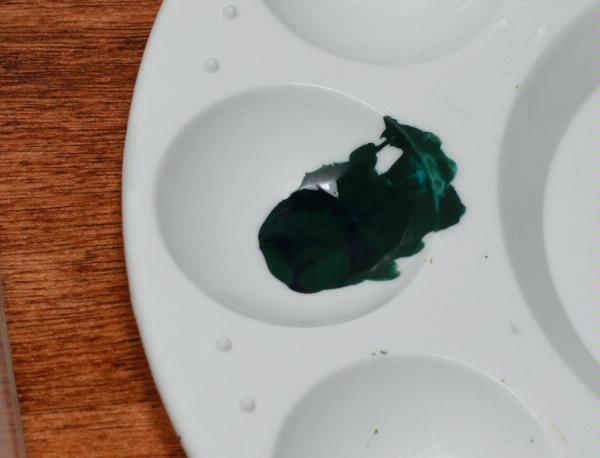 Throw some Orkhide Shade down on your palette and mix in a generous amount of water. You want the paint runny enough so that you can quickly touch the brush to the model and get a nice, rounded shape. 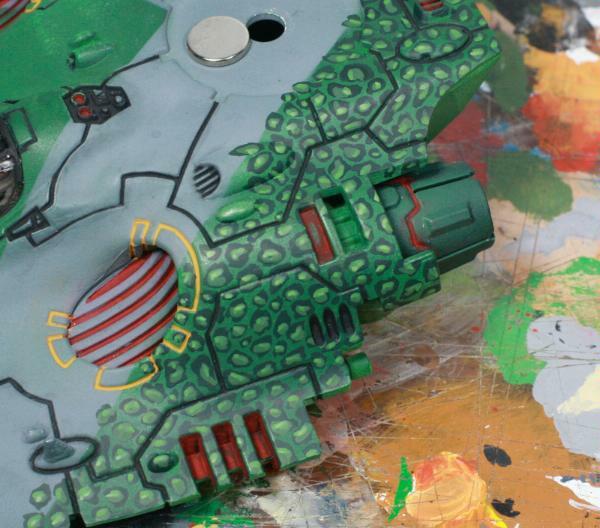 But don't make it so runny that the paint is dripping down the angles surfaces of the tank. Start with 1 water : 2 paint and thin more if needed. The Foundation colors especially might need a little more thinning than the normal Citadel Colour paints. I didn't want to strictly follow the grey line, so I left some space for grey scales merging into the green background and placed some green scales overlapping onto the grey. I think it looks more natural when the scales don't strictly follow any lines, so I have a tendency to wrap them even onto the bottom of the tank. 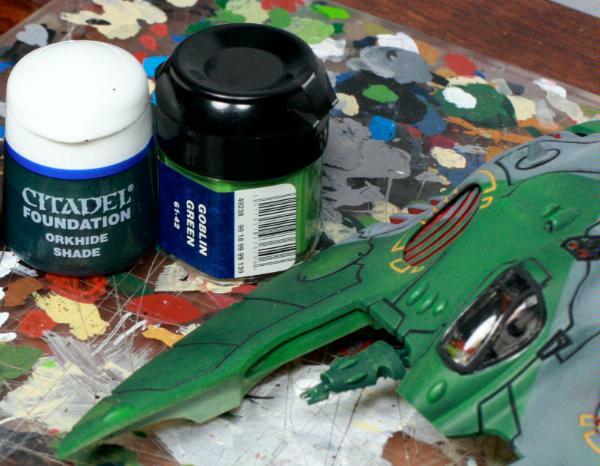 Now grab an equal portion of the Goblin Green and add it to the Orkhide Shade. You'll probably want to add more water at this point to maintain your consistency. 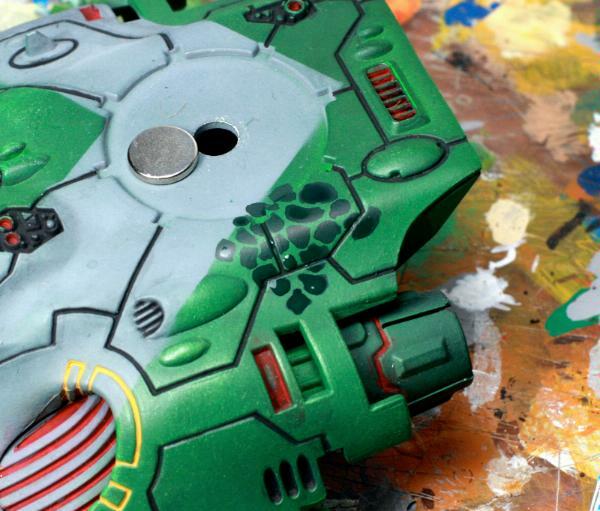 If you are working on a whole tank at a time, I recommend that you take breaks during painting each color to wash out your brush and make sure the paint on your palette stays the same watery consistency. 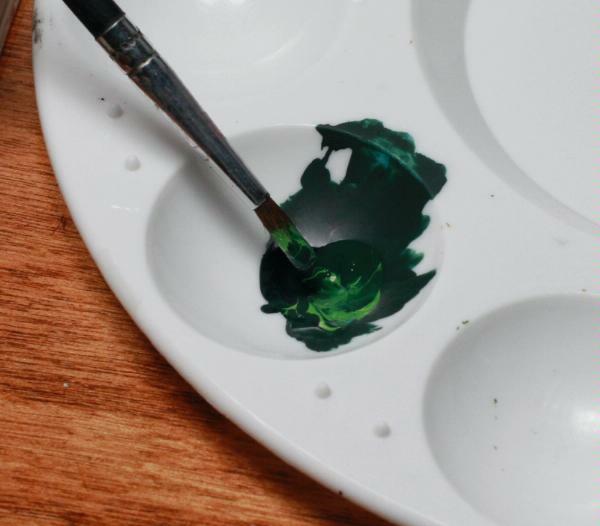 If you notice it starting to thicken up or start to dry up on your brush, take a break and add water to the paint and rinse out your brush. If the mixed color you end up with is similar to the base color you started with before painting scales, then you probably picked a nice coordinating pair of colors. When painting the intermediate color, make sure that you vary the placement on the existing scale and try to always leave a dark edge showing all the way around the new color. You can put just a dot in smaller scales, fill the middle on some or even just make small curves with the mid-highlight. Varying the shape gives a more varied pattern while highlighting everyone the same can give a regimented, consistent look. Do whatever works for you. This step will go faster than the base scale color, since laying down the base pattern probably takes about half the total time of painting this effect. Now you need to paint straight Goblin Green as a very small highlight on each scale. Keep the paint watery like before for smooth shapes, but make sure that you don't have too much paint loaded on your brush or it will be difficult to control and make small highlights. This stage goes pretty quickly, as you're just touching a small bit of color to each scale. Try to make small curves instead of dots or straight highlight lines. This last step is optional, but I like to add a little more highlight to scales that are on prominent ridges or edges of the tank. Mix about 1 Goblin Green: 1 Bleached Bone and a liberal amount of water and then just highlight the scales on edges and ridges. It takes just a small amount of time to do this and really adds a lot of depth in person. I highlighted the scales on the ridge above the engine, a few on the edges of the tank and on the bulging vents. That's all there is to it. This section of the tank probably took about an hour to do, including arranging photos, but after you get the hang of the scale pattern, it really is pretty mindless work. You can even save your time and putting down the scale pattern over select portions of the tank, instead of covering the whole thing. Sometimes less is more and less is certainly less time spent. Here's another tank I am working on with red scales built up from a dark red-black and green scales with the lighter plus darker technique explained above. This technique also works on a smaller scale, like on a capes, robes and cloaks. Each step is the same, just with smaller scales and a tinier pattern. I kind of like it better before you put the scales on it. Yeah, it doesn't really fit with my Black Templar army, although I could use it on an Adamantine Mantle. 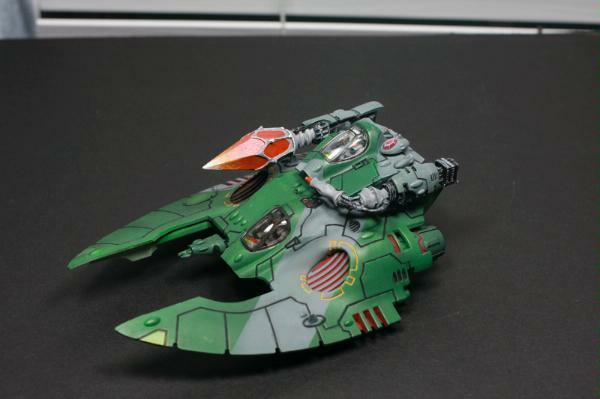 But it would be a great effect to add to Salamanders vehicles. 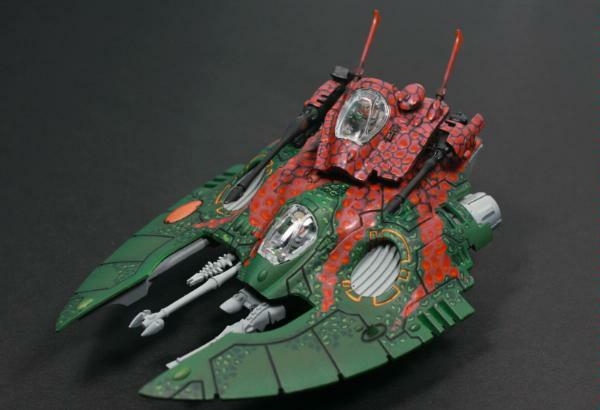 I second the opinion on using this for Salamanders. The spots/scales look a bit more like giraffe spots than scales IMO, but look very nice. I like the green and red by themselves more so than the red and green patches agains one another - too much contrast I think. I did something similar for the gaunts I painted up last year and it looks sharp on them, a very natural camouflage pattern. 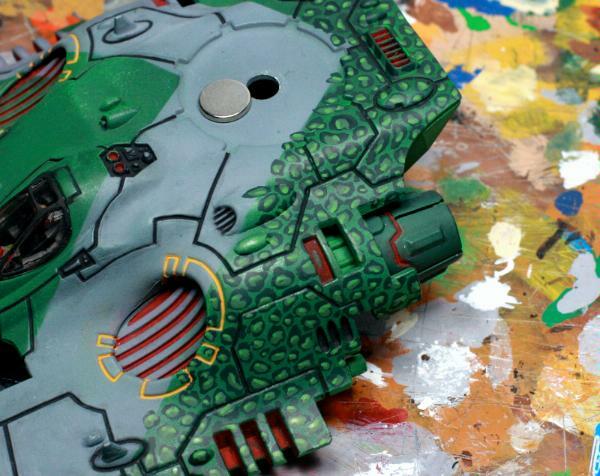 Gavin Thorne wrote: I second the opinion on using this for Salamanders. The spots/scales look a bit more like giraffe spots than scales IMO, but look very nice. Giraffe spots is dead on. I'll explain that to my opponents at my next tournament: "Hey, you just got wrecked by the giraffe Falcon!" 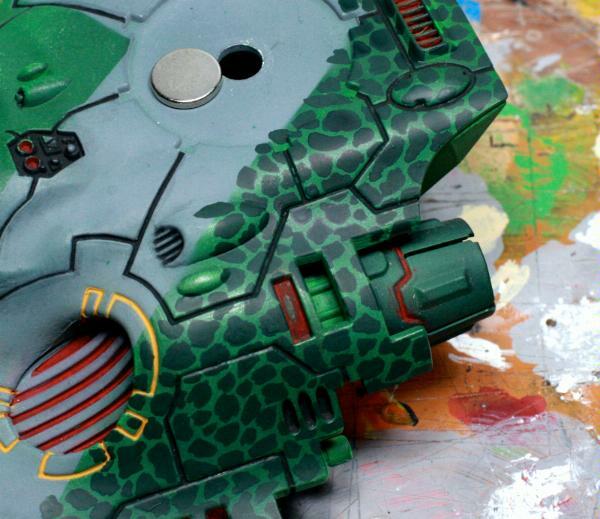 It is a nice organic pattern, and much easier to paint than proper overlapping scales. You're not a geek if you can beat the out of people who call you a geek, as such, i am not a geek. Purgo vestri vesica per vestri hostilis cruor. If you want actual 'scales', there's a good tutorial HERE on Camo Specs Online. Totally looting this for my salamanders vehicles. This looks awesome. "Wot, This? Naw I've had this fer ages. Of course the paint's still wet, it's me favourite. Sell it to ya if you like. One Careful owner."